What does one say about this recipe. One it isn't really a recipe, as it is just assembling 4 store bought ingredients together. Two, it isn't exactly healthy. And three, one and two don't matter, you simply have to try this at least once. It was Halloween and as I am not a Halloween enthusiast, I do dabble in it from time to time for my kids sake, but this year my kids did not go trick or treating, so I thought I would make a few treats at home. I made Red Velvet Halloween cupcakes the day before Halloween, they loved those, I bought a packet of redskins for Halloween, they loved those, then I saw this on line and I knew this was something they would love. And they did. These are so easy to make, and come out looking amazing, and they do taste as good as they look. Now you can buy a block of chocolate and coarsely chop it, but I find that messy and time consuming. 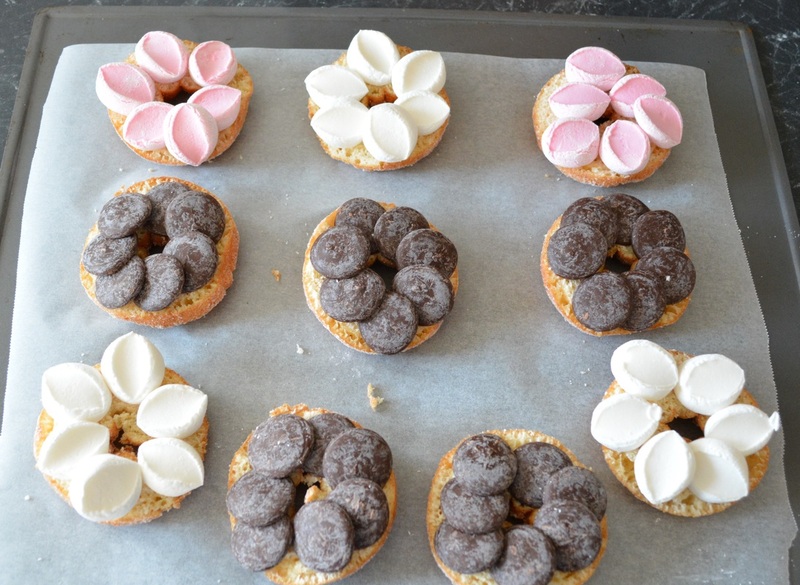 The choc melts are easier to use and because they are round, they look like a flower when you assemble it. You can also use mini marshmallows instead of the big ones, that works great to. They original recipe said to grill the doughnuts to melt the chocolate and marshmallows, but I found that the marshmallows burnt this way so I decided to heat them in the oven. I even made it in the microwave, just heated it for 30-40 seconds before adding the strawberries, worked just fine. Preheat your oven to 180C. Line a baking tray with baking paper. Using a serrated knife, slice the doughnuts in half crossways. Place on your baking tray, cut side up. 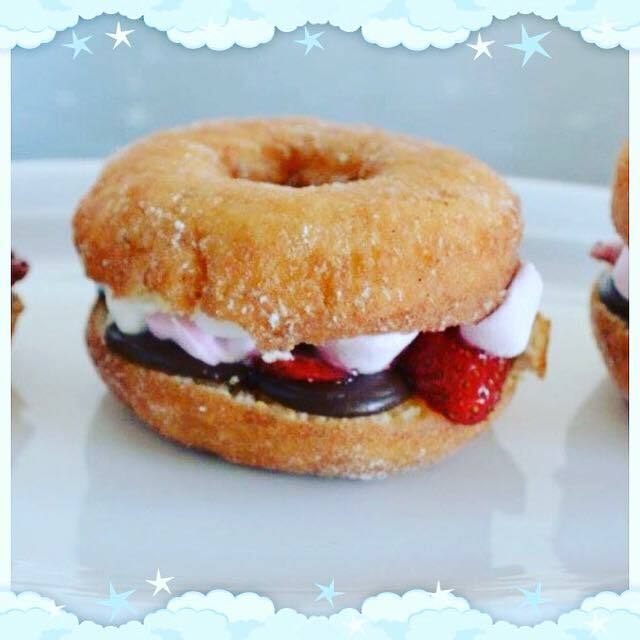 Top the doughnut bases with the chocolate melts. Top the doughnut tops with the marshmallow. Place in your preheated oven for about 2-3 minutes or until the chocolate and marshmallows begin to melt, the chocolate melts will keep their shape, but if touched are soft. 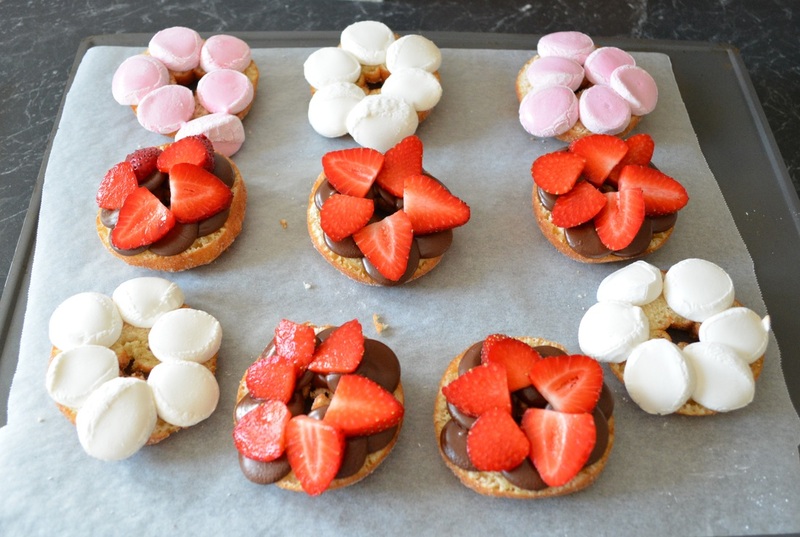 Place the sliced strawberries onto the melted chocolate. Sandwich with the doughnut tops, pressing down gently. Serve immediately.